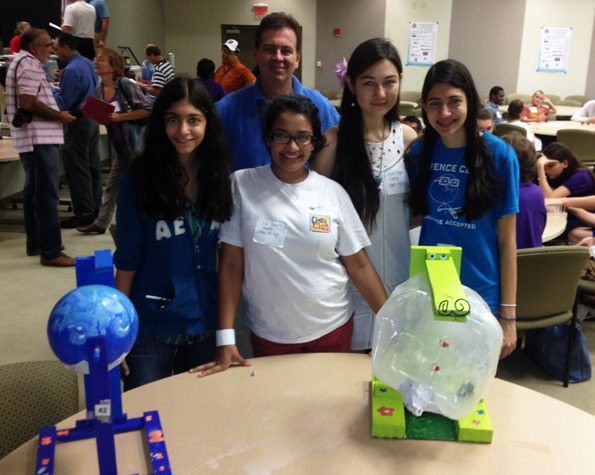 CCHS’s Science Club participated in the annual Water Tower Competition on December 8th in Boca Raton. The competition, which was created a few years ago by the American Water Works Association, judges each water tower based on creativity, cost, hydraulics and structural efficiency. The AWWA divides the state into regions, with CCHS’s Science Club in Region VI. Typically, about 5-12 other schools participate in this region’s competition, each bringing 2-3 entries. The Science Club has been preparing for the competition for over 2 months. Members brainstormed and proposed designs during the first few meetings, after that, it was the matter of making those designs come to life. This year, the Science Club originally planned to create 3 designs, however, due to lack of time, only two were entered. Out of the three original ideas, one was a new design. Meeting every Wednesday in room 234, the members of the club spent the last few weeks creating the water towers. Finishing touches were made on the two towers on December 5th– 7th, the last time the members would get to complete the towers before the competition. At the competition the CCHS water towers both broke in the middle of the demonstrations and didn’t place. The towers scored well in cost efficiency, and creativity, but the structural and hydraulic efficiency points brought them down. However, the Science Club members are determined not to let their loss set them back are already moving on to more ways to express their love and knowledge of science. “Although we didn’t win, we have learned from our loss and are already preparing to do our best and win future competitions,” Bacon said.